This is the second in a series of posts on strategies for a simpler, yet creative, summer. 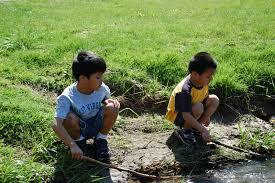 “Less is More #1” discussed letting children explore the world in search of a bit of adventure. Today I’d like to talk about playing with stuff. Not toys. Stuff. Every parent knows that toddlers are likely to have more fun with the box holding an elaborate new toy than the toy itself. It is also true that children with an abundance of toys can find new ways of playing with things that aren’t toys in the usual sense. “Stuff” can range from the contents of the kitchen cupboard to sticks in a yard or park. Consider the play potential of some of these. Sticks and Leaves. Now I’ve started by cheating a bit, since the stick was inducted into the National Toy Hall of Fame in 2008, but it still qualifies as stuff in my world. So, build a fort or camp. Draw in the dirt. Make fairy furniture. Create a wizard wand. Create a tic tac toe board on the ground. Stack for a campfire (later, with adults). Throw a stick for a dog or hike with a home-made walking stick. Make a stick sculpture. And yes, make a sword and play carefully. Stones, Dirt and Mud. Sticks and stones just naturally seem to follow one after another. 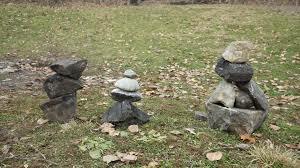 Make a stone cairn for your yard or a tiny one for any local leprechauns. Paint rocks. Select stones to play chess, checkers, or tic tac toe. Throw stones in a pond. Find flat stones for skipping. Make a mud pie. Walk in mud and let it squish between your toes. How would mud work for painting? Make mud bricks and see if they harden. Try it with dirt from different areas. Do they all work? Perhaps you can build a mud house, garage, or castle. And, of course, if you live near water and sand, build a castle or a city or a creature. Water. 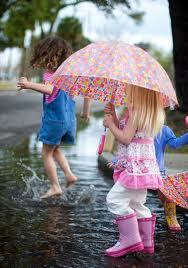 What says summer play more than water? Jump in a puddle. Walk outside when it is raining and get soaked. Run through a sprinkler or jump in a pool. Pour water from one pan to another. Create a system to move water from one place to another using only kitchen utensils, or perhaps supplies from the garage. Take all your (non electronic) toys outside and wash them. Get a sponge really wet and toss it back and forth. Make a birdbath from something you were going to throw away. Boxes and other Recycling. Another Hall of Fame inductee, what can be more fun than a box? The bigger the better. Make a cave, a fortress, a castle, or a space ship. Make furniture for dolls (or patient pets), garages for toy trucks, or a system for organizing your favorite stuff. I love this author’s suggestion for a BYOB—Bring Your Own Box—neighborhood gathering, but if that feels like too much for a simplified summer, just save cereal and other boxes for a week or two and see what you can create with your own family. Add the contents of the recycling bin and you can end up with something spectacular. Or take plastic destined to be recycled and build a path to carry water, build a sculpture, or anything else your imagination dictates. Blankets. I was going to stop after four categories of “stuff” but when I saw that blankets, too, had rising to Hall of Fame toy status, I knew they had to be included—and besides, they might be particularly enjoyable for my Australian readers who have left summer behind. Of course blankets make spectacular caves, hiding places, and fortresses of all types. They can be a cape for a superhero, an island in the middle of the floor ocean, or the curtain for a puppet show. Or try one of these blanket games. I love the image of a group of children standing on a blanket, racing to turn it upside down without ever stepping off the blanket. Talk about problem solving! It is a simple recipe. Take some children. Add some stuff and stand back. Let the creativity begin. Here’s to a summer playing with stuff—enjoy! And when you find some really good stuff, please share.